The Returned Peace Corps Volunteers (RPCVCO) teamed up with the Denver Nuggets for a new and exciting fundraising event that brought together RPCVs and their family and friends to see the Nuggets take on the Celtics on Friday, March 10, 2017 (click here for the event details). 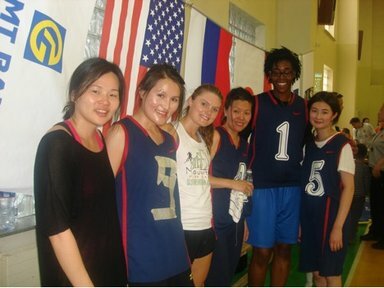 Currently serving Peace Corps Volunteers (PCVs) are also using basketball to bring together the community members. Check out these two stories from PCVs that are using basketball as a way to make friends in their community as well as to teach youth leadership and life skills, which important skills and knowledge when working towards gender equality.